Building standards for the external walls have been amended following the Grenfell Tower fire. 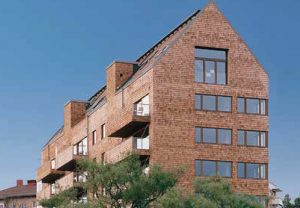 Although this was not a timber building and did not have timber cladding, the use of combustible construction materials will not be permissible on the outer walls of residential buildings over 18m (six storeys) high. This means that timber construction systems, such as CLT, will need separation between the structure and the outer face of a residential building over six storeys high. A number of ways to achieve this can be considered, without compromising the integrity of the CLT structure. This does not affect timber frame systems, which are suitable for lower-rise buildings. Structural – in most cases, the principal load bearing and stability structures of a CLT residential building are the internal walls and core. Some changes to approach will be required to ensure stiffness of the slab edge and support for balconies but these should be readily accommodated. Sequencing – the efficiency of having all structural elements of a building being erected at the same time would be affected. Ideally a closed panel system could be delivered concurrently with the CLT slabs and internal walls so that all the current advantages of speed and safety can be met. This will require greater coordination. Fire safety – using large format engineered panels that combust slowly is a more effective way of limiting the spread of fire and smoke beyond the ignition site than many other commonly used methods. As the industry seeks to devise a new methodology for external walls, there is an opportunity to develop a more complete solution of wall/window/insulation/cassette that improves on current approaches. Volumetric Modular – the biggest impact will be on volumetric modular systems using CLT. It will be less practical to vary the wall type in a mass production environment. Furthermore, the benefits of solid panel construction for resistance 0f shear forces and stacking will be challenging to replicate in a closed frame panel. There is a likelihood of volumetric modular solutions using CLT being curtailed. Subject to paragraph (3)*, building work shall be carried out so that materials which become part of an external wall, or specified attachment, of a relevant building** are of European Classification A2-s1, d0 or Class A1, classified in accordance with BS EN 13501-1:2007+A1:2009 entitled “Fire classification of construction products and building elements. Classification using test data from reaction to fire tests” (ISBN 978 0 580 59861 6) published by the British Standards Institution on 30th March 2007 and amended in November 2009. * paragraph (3) lists exclusions, which include window frames, door frames, seal, membranes etc. No timber can be used in external walls of residential buildings above 6/7 storeys, other than in window frames, doors and door frames. Specifically this would exclude CLT in the external walls of any residential building above 6/7 storeys. The use of timber for floor slabs, internal walls, cores or any other internal use is not covered by the ban.